Takayuki Ueno continues his search for his eldest son Kotaro and other missing people in Minami-Soma, Fukushima Prefecture. A documentary about a farmer’s years-long quest to retrieve the bodies of four family members killed in the 2011 earthquake and tsunami disaster has won an award that honors a slain journalist. The Mika Yamamoto International Journalist Award was presented to Chiaki Kasai in Tokyo on May 26 for her “Life–Another Story of Fukushima,” which was completed last year. The prize was established to perpetuate the spirit of video journalist Mika Yamamoto, who died while covering the civil war in Syria in 2012. Kasai’s 115-minute documentary charts the struggles of 45-year-old Takayuki Ueno as he tries to rise from the depths of despair over the loss of his two children as well as his parents, who were swept away by tsunami generated by the magnitude-9.0 Great East Japan Earthquake. Kasai’s story takes place in Fukushima Prefecture, where the Fukushima No. 1 nuclear power plant went into a triple meltdown when the facility’s cooling system was knocked out in the quake and tsunami. It takes place over a number of years. Ueno lived in the city of Minami-Soma, which was hard-hit by the tsunami. Ueno had just begun searching for his loved ones when hydrogen explosions rocked the nuclear plant, just 22 kilometers away. Despite radioactive substances spewing from the stricken plant operated by Tokyo Electric Power Co., Ueno refused to evacuate. No police or Self-Defense Forces members were coming to rescue him or others stranded in the area. Ueno found the body of his 8-year-old daughter Erika caked in mud and carried her to a makeshift morgue. He, along with volunteers, still searches for the body of his son Kotaro, 3, as well as others swept away by the tsunami. At the time, Kasai, 43, worked for a Hamamatsu-based TV station. She spent the best part of five and a half years documenting Ueno’s life. She completed the project in January 2017, and it was first shown the following May. Six months after the disaster, Kasai visited Fukushima Prefecture, where she heard about Ueno’s family tragedy and realized that many people were unable to search for missing family members because of the nuclear accident. Kasai quit the TV station in 2015 so she could devote herself to the documentary and spend more time visiting devastated areas. Yamamoto, the journalist who perished in a gun battle while covering the fighting in the Syrian city of Aleppo, had made a name for herself covering Afghanistan, Iraq and other war zones around the world. She was 43 when she died. The award was established in 2013 as a way to encourage news gathering on people living in conflict or impoverished areas to raise awareness of their plight. The award is given to journalists who cover people living in extreme conditions. Each award-winning work to date was a record of a conflict being waged away from Japan. “Wars and disasters. There are people who hang in there, no matter what unreasonable things are thrown at them in life. (Kasai’s) approach to taking time to present her story honestly and in a respectful manner overlapped with Yamamoto’s footsteps,” said Akihiro Nonaka, head of Asia Press International, who served as a member of the award’s selection committee, explaining the decision to choose a work themed on disaster this year. One scene in the documentary shows Ueno weeping and muttering that he “can’t remember” the sound of his children’s voices. He later confesses that he is “scared” to see his eldest daughter’s classmates all grown up. Still, encouraged by how his 6-year-old second daughter Sarii, who was born in 2011, is managing, Ueno tries to stay on top of things while continuing to search for his missing loved ones. A scene toward the end of the film shows Erika’s former classmates dressed in their junior high school uniforms visit Ueno’s home to pray in front of the family’s Buddhist altar. Ueno and his wife Kiho, 41, see the girls off as they leave, soft smiles creasing the couple’s faces. The title of the film clearly resonates with the audience. Learning that she had won the award, Kasai expressed sadness rather than happiness as Yamamoto is no longer alive, recalling that they once shared a meal together. “I feel like she gave me a supportive push to keep telling the world what happened in Fukushima,” she said. Ueno commented that he hoped the documentary would serve as a warning not to allow a similar event to occur again. To estimate the beta- and gamma-ray doses in a brick sample taken from Odaka, Minami-Soma City, Fukushima Prefecture, Japan, a Monte Carlo calculation was performed with Particle and Heavy Ion Transport code System (PHITS) code. The calculated results were compared with data obtained by single-grain retrospective luminescence dosimetry of quartz inclusions in the brick sample. The calculated result agreed well with the measured data. The dose increase measured at the brick surface was explained by the beta-ray contribution, and the slight slope in the dose profile deeper in the brick was due to the gamma-ray contribution. The skin dose was estimated from the calculated result as 164 mGy over 3 years at the sampling site. The main fission products from the Fukushima Daiichi nuclear power plant (FDNPP) accident are 129mTe-129Te, 131I, 132Te-132I, 134Cs, 136Cs and 137Cs [1–4]. These radionuclides emit gamma rays and beta rays through β− decay. However, there are few studies about dose estimation from beta-ray irradiation following the FDNPP accident [5–7]. The beta-ray dose contributes to the whole-body dose among small biota, such as insects, plant leaves, and human skin. Therefore, beta-ray dose estimations are important for the risk assessment of the impact of the FDNPP accident (including on small biota) to clarify the effects of this large-scale radiological accident. Retrospective dosimetry with brick samples has been used to evaluate the gamma-ray dose of the Hiroshima atomic bomb [8–10], the Chernobyl nuclear power plant accident [11–14], and the Semipalatinsk nuclear weapon testing [15, 16]. Recently, Stepanenko et al. used retrospective dose evaluation of brick samples to estimate gamma-ray doses and perform beta-ray dose reconstruction for the FDNPP accident with a similar method to that used for a Hiroshima tile sample . They used a single-grain quartz optically stimulated luminescence (OSL) method (similar to that of Ballarini et al. , although layer-by-layer consequences for very thin layers of the sample’s aliquots were used for analysis, with separate dose calibration for each quartz grain) with brick samples taken in 2014 from Odaka, Minami-Soma City, Fukushima Prefecture, Japan . Dose enhancement near the surface of the brick was identified by the OSL measurements . Stepanenko et al. suggested that the enhancement was caused by the beta-ray dose from the deposited fission products . To establish the cause of the dose enhancement near the brick surface, we performed a Monte Carlo simulation of a small brick building with radionuclides uniformly distributed on the ground surface. The calculated results were compared with the data measured by Stepanenko et al. . The depth profiles of the dose in the brick sample for beta rays and gamma rays were estimated separately, and the dose enhancement near the brick surface was discussed. The energy deposition as a function of depth in the brick wall of a small building was calculated using the Particle and Heavy Ion Transport code System (PHITS) Monte Carlo code Ver. 2.52 . The calculation geometries are shown in Fig. 1. The calculation regions were 1 m × 1 m for beta rays and 21 m × 21 m for gamma rays. The calculation regions consisted of ground, air, and the small brick building (red region: 0.5 m × 0.5 m square, 1.5 m high, wall thickness of 10 cm). The brick building was located in the center of the soil surface. Beta- or gamma-ray sources were uniformly distributed in the 5-mm-thick soil surface (brown region). To save calculation time, the previously reported mirror condition was used for these calculations . Figure 1a shows the geometry used to calculate the radiation that entered the calculation region (outer source calculation) via the mirror boundary. First, the histories for the particles were accumulated near the mirror boundary (green lines) without the brick building. Second, the particles were generated from the mirror boundary (back line) in Fig. 1b according to the accumulated histories. The generated particles were transported to the brick wall cells (yellow box) of the brick building. Third, radiation was generated from the surface of the 5-mm-thick soil layer (brown region) in the calculation region (inner source calculation) in Fig. 1b. The energy deposition in brick cell layers of 10 m × 10 cm and thicknesses of 0.1, 0.2, 0.3, 0.4, 0.5, 1, 3, 5, 7.5, 10, 20, 40, 60, 80 and 100 mm were obtained by summing the outer and inner source calculations corrected with the number of particles generated per unit area. (a) Mirror condition calculation, (b) top view and (c) side view of the calculation geometry. Beta and gamma rays from 129mTe, 129Te, 131I, 132Te, 132I, 134Cs and 137Cs were calculated separately. Beta-ray energy spectra were taken from the literature , and the internal conversion electrons of 137Cs were taken from the website of the National Nuclear Data Center . The gamma-ray energies and emission rates for the radionuclides were taken from the National Nuclear Data Center . The elemental composition of the brick sample was Si: 28.9, Si: 50.4, Al: 17.5, Fe: 1.4 and Ti: 1.8 wt %, and those of soil and air were taken from the literature . (1) where Eijk is the energy deposition (J) at the i-th depth by beta or gamma rays from the k-th radionuclide, mb is the brick sample mass (kg), and aj is the area of the source (0.75 and 1 m2 for inner and outer beta calculations, 440.75 and 441 m2 for the inner and outer gamma calculations, respectively). Ij is the emission rate for beta or gamma rays per Bq and fc is the conversion factor of the stopping power ratio  for beta rays and the kerma ratio  for gamma rays between air or tissue and brick to convert from the brick dose to the air or tissue doses. (2) where Tk is the half-life for each radionuclide of k = 129mTe, 129Te, 131I, 132Te, 132I, 134Cs and 137Cs (Table 1), and τ is the time period from deposition to the brick sampling date. A 137Cs deposition density of 308 kBq/m2 and the ratio of each radionuclide to 137Cs deposition density taken from the literature  were used to obtain Ak for each radionuclide. The deposition densities for the seven radionuclides are listed in Table 2. The beta-ray dose rates on the brick surface and gamma-ray dose rate at a depth of 0.5 mm in the brick at a height of 80 cm are shown in Fig. 2a and b, respectively. 129m, 129Te contributed less to the gamma-ray dose rate, and accounted for the third and fourth largest contribution to the beta-ray dose rate. This is due to the small gamma-ray emission rate per decay of 129m, 129Te of <10%. The gamma- and beta-ray doses decreased by ~10% and ~30%, respectively, over 1 month. The calculated beta-ray dose rate decreased slower than the calculated gamma-ray dose rate. Air dose rates of (a) beta rays and (b) gamma rays over time. Beck reported conversion factors for various radionuclides to estimate the air dose rate at a height of 1 m from the unit deposition density of radionuclides . The initial gamma-ray air dose rates (15 March 2011) at a height of 80 cm from the ground for each radionuclide obtained by our calculations were compared with the values estimated by Beck conversion factors  interpolated at a relaxation depth of 0.65 g/cm2 (Table 2). The present dose rates were estimated to be 57% lower than those calculated by Beck conversion factors. The present dose rates were in-brick values in one of the walls of the brick building, whereas the Beck conversion factor values were free-in-air values. Therefore, the difference of 57% can be explained by shielding effects, whereby gamma rays from behind the building are neglected. The cumulative dose over 3 years, from 12 March 2011 (Unit 1 explosion) to 19 March 2014 (brick sampling by Stepanenko et al.) and the dose rate change over time are shown in Fig. 3. The solid line shows the calculation result, the dashed histograms are the averaged calculation values for the measured sample thickness, and the open circles are Stepanenko’s data . The calculation agreed well with the data measured by Stepanenko et al. in the region deeper than 10 mm. The results indicated that the cumulative dose deeper in the brick was due to gamma rays, and that the dose enhancement at the surface was dominated by the beta-ray contribution. The difference between the calculated and measured doses at the surface was about 2 standard deviations. A possible explanation might be connected with the contributions of low γ emission rate radionuclides, such as 89Sr, 127mTe-127Te, 140Ba-140La, etc. However, the trend in the dose increase at the brick surface was supported by the calculations. Therefore, the single-grain OSL measurement by Stepanenko et al. shows the advantage of dose estimations not only the cumulative gamma-ray dose but also the cumulative beta-ray dose. Thus, we concluded that the single-grain OSL method is a good tool for retrospective beta-ray dose estimation. Comparison of the calculated beta rays (chain line), gamma rays (dotted line), beta + gamma rays (solid line), dose averaged over sample depth (dashed histogram), and data measured by Stepanenko et al. (open circles). The calculated tissue dose at a brick depth of 50 μm was assumed to be a skin dose, and would be similar to a 70-μm tissue dose. The skin dose was estimated to be 164 mSv for 3 years at the sampling location. To confirm the cause of the dose enhancement near the surface of a brick sample taken from Odaka, Minami-Soma City, Japan, a Monte Carlo calculation was performed using PHITS code and the calculated results were compared with measurements. The calculated results agreed well with previously published measured data. The dose enhancement at the brick surface in the measured data was explained by the beta-ray contribution, and the gentle slope in the dose profile deeper in the brick was due to the gamma-ray contribution. The calculated result estimated the skin dose to be 164 mGy (164mSv) over 3 years at the sampling location. MINAMI-SOMA, Fukushima Prefecture–Radiation readings here on the Pacific coast north of the crippled Fukushima No. 1 nuclear power plant are almost identical to those of sample cities on the other side of Japan. The Minami-Soma government initiated the survey and hopes the results of the dosimeter readings, released Sept. 4, will encourage more evacuees to return to their home areas after they fled in the aftermath of the 2011 nuclear disaster. A total of 100 portable dosimeters were handed out to 25 city employees from each of four cities–Minami-Soma, Tajimi in Gifu Prefecture, Fukuyama in Hiroshima Prefecture and Nanto in Toyama Prefecture. They were asked to take them wherever they went from May 29 through June 11. The staff members were evenly dispersed with their homes in all corners of the cities they represented. In addition, only those living in wooden houses were selected as different materials, concrete walls, for example, are more effective in blocking radiation. In July 2016, evacuation orders for most parts of Minami-Soma were lifted, but not many residents have so far returned. The city’s committee for health measures against radiation, which is made up of medical experts, analyzed the data. The median value of the external radiation dosage of the 25 staff of Minami-Soma was 0.80 millisieverts per annum, while the average value was 0.82 mSv per annum, according to Masaharu Tsubokura, the head of the committee and a physician at Minami-Soma general hospital. No significant difference was found in the three western cities. Both figures were adjusted to include the natural radiation dose, and are below the 1-mSv per annum mark set by the national government as the acceptable amount of long-term additional radiation dosage, which is apart from natural radiation and medical radiation dosages. 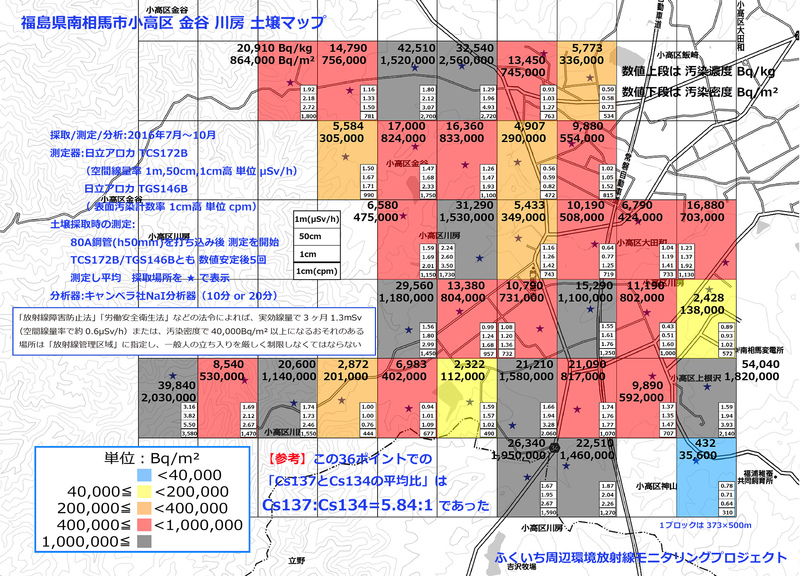 The radiation doses in all cities were at levels that would not cause any health problems, according to Tsubokura. As we see in the article, portable dosimeters were handed out to city employees. They　spend most of their day time in an office protected by concrete walls which are efficient for blocking radiation as stated in the article. However, in Minami-soma, most of the population spends more time outside, very often working in the fields. Their life style is different and therefore the external radiation dose cannot be similar to those of city employees. The result of the comparison between the external radiation dose of city employees cannot be used as an argument to say that it is safe for the local population to live in Minami-soma. 2) In the article of Fukushima Minyu, it is stated that in Minami-soma the radiation dose has a wider range than in the other three cities. This means that there are hotspots, which leads to higher risks of internal irradiation. 3) The radiation dose expressed in terms of Sieverts is relevant for radioprotection when the source of radiation is fixed and identified. This is the case for most of the nuclear workers. However, in the case of Fukushima after the nuclear accident where the whole environment is radio-contaminated and the radioactive substances are dispersed widely everywhere, it is not a relevant reference for radioprotection. It is important in this case to measure surface contamination density, especially of soil. 4) 6 years and 6 months since the accident, cesium has sunk in the soil. It is thought to be between 6 and 10 cm from the surface. This means the top layer of soil from 0 to 5 cm is blocking the radiation, reducing the measures of the effective dose. However, this does not mean that the population is protected from internal irradiation, since cesium can be re-scattered by many means, by digging or by flooding, for example. 5) The reliability of individual portable dosimeters has already been raised many times. This device is not adequate to capture the full 360° exposure in radio-contaminated environments as described in point 3 above. 6) In the article, it is stated that background radiation is included in the compared values, but it does not mention the actual background radiation measurements in the 4 cities. To summarize, the sample study group does not represent the overall population. The study doesn’t include the risks of internal radiation, for which the measurement of contaminated soil is indispensible. The dosimeters are not adequate to measure the full load of radio-contaminated environments. So, the research method is not adequate to draw the conclusion to say that it is safe for the population to return to live in Minami-soma. Tomoko Kobayashi, right, prepares with a volunteer worker for the reopening of her Futabaya ryokan in the Odaka district of Minami-Soma, Fukushima Prefecture, on July 11. MINAMI-SOMA, Fukushima Prefecture–It was no ordinary homecoming for Tomoko Kobayashi, after an enforced absence of more than five years due to the 2011 Fukushima nuclear disaster. She says she is “in no mood for celebration” given the daunting task facing her: having to start from scratch at the traditional ryokan inn that has been in the family for nearly 70 years. The community that Kobayashi had called home was overrun with rats, wild boar and palm civets, and she struggled to protect the family business from that nightmare. Kobayashi’s journey home to start afresh took her via Ukraine, which she visited in 2013 to learn how victims of the world’s worst nuclear accident–the Chernobyl disaster in 1986–were coping after all those years. Kobayashi, 63, was shocked by the different approach authorities there had taken compared with that of Japan. She said Ukraine takes a more cautious approach toward radiation risks. Kobayashi returned to Minami-Soma’s Odaka district on July 12 after the central government lifted a ban for 11,000 or so evacuees from the district, which is within a 20-kilometer radius of the crippled Fukushima No. 1 nuclear power plant. Her initial concern is living with low-level radiation. She also worries for her future and whether she can get the business up and running. With her husband, Takenori, 67, Kobayashi has reopened Futabaya ryokan. The inn that she took over from her mother 10 years ago has 15 guest rooms and is located in front of JR Odaka Station, which is 16 km from the plant. Another of her concerns centers on whether her return home to reopen the inn could play into the hands of the authorities. “The central government is eager to wind up the program that compensates the victims,” she said, alluding to a sense that evacuees are being encouraged to return so that financial redress can end. On the plus side, the radiation level in her neighborhood has dropped to below 0.2 microsievert per hour. Although it is three times the level before the triple meltdown in March 2011, the figure is significantly lower than in the immediate aftermath. Since the disaster, Kobayashi has closely monitored the radioactivity of food, drinking water and soil by working with a local citizens group. In one instance, radioactivity registered more than 10,000 becquerels per kilogram when she measured the levels of the dust and dirt sucked up in a vacuum cleaner at her home. Returning home means she still faces the risk of exposure to long-term, low radiation. How this could affect her health is not understood by scientists. Odaka was previously designated a “zone in preparation for the lifting of the evacuation order,” where an annual radiation dose is estimated at 20 millisieverts or below. Extensive decontamination work over the past three years paved the way for the evacuees’ return. Despite the lifting of the ban, only 10 to 20 percent of the residents from Odaka and other parts of Minami-Soma are expected to go back. Evacuees are reluctant because of the potential hazard of the long-term, low radiation exposure and the new living and social networks built during the five years they were away. They are also wary of the risks of moving back in the vicinity of the nuclear complex where the unprecedented scale of work to decommission the damaged reactors is under way amid a host of challenges, including an accumulated buildup of highly radioactive water. Before the nuclear accident, Kobayashi had a staff of five that washed and starched the linen. It was a hallmark of her ryokan’s hospitality. With only one staffer coming back, however, Kobayashi has to forgo the starched sheets. At one point, more than 60,000 of the city’s 72,000 residents evacuated, including those who left voluntarily. After she moved into temporary housing in Minami-Soma in 2012, Kobayashi occasionally visited the inn to clean up. The dark waters of the tsunami, spawned by the magnitude-9.0 tremor on March 11, 2011, almost reached the front door of her ryokan, even though it is situated 3 km from the coast. Her neighborhood, which was blessed with a wide array of edible wild plants, mushrooms and freshwater fish, was transformed into a “gray ghost town.” The landscape became increasingly bleaker as gardens of homes were occupied by piles of black plastic bales containing radioactive waste from the cleanup operation. Kobayashi had many sleepless nights. She wondered whether she could ever pick up the threads of the existence she led before the catastrophe. Her turning point came in September 2013 when she joined a tour to the region in Ukraine devastated by the Chernobyl accident. “I was curious to know how victims of a nuclear accident considered more serious than Fukushima’s are faring nowadays,” Kobayashi said. Kobayashi also wanted to convey her gratitude to those affected by the Chernobyl explosion in Zhytomyr province for sending 150 dosimeters to Minami-Soma. The devices proved to be invaluable at a time when the city badly needed them. When her tour group visited Zhytomyr, the residents there shared their experiences and answered questions sincerely. What struck Kobayashi during the trip was the disparity between Ukraine’s local government and Japanese authorities in their handling of radiation risks and programs made available to help the victims. In Ukraine, authorities are more hands-on. “No Trespassing” and other warning signs were put up in communities, although their doses of radiation were lower than that in Odaka. Ukraine authorities issued a warning on the basis of radioactive contamination in the ground as it could lead to internal radiation exposure of residents through the spread of radioactive dust. She also learned that a large number of people in Zhytomyr have developed health problems, not just cancer, but also a wide variety of diseases. But they are guaranteed by law the right to receive treatment or to take refuge. That is in sharp contrast with the Japanese government briefings with evacuees, which barely touched on the long-term, low radiation risks. Kobayashi is outraged by this. “The Japanese government steered displaced people toward their return by repeating that an annual exposure of up to 20 millisieverts poses little health risk,” she said. Kobayashi said she would have been less suspicious of the intention of Japanese officials if they had candidly admitted that they didn’t know about the possible effects on health. She is also angered about the way authorities treated evacuees in light of the July 12 lifting of the ban. Evacuees from Minami-Soma’s Kawabusa district, a mountainous area that fell in the “residence restriction zone,” were also allowed to return. The zone is defined as one registering an estimated annual dose of between 20 to 50 millisieverts. Although a dose in Kawabusa was confirmed to have dropped to less than 20 millisieverts, the clearance came as a surprise to many locals since it ran counter to the government’s previous policy of designating such an area first a zone in preparation for the lifting. Kawabusa is home to about 300 people, including many children. Despite a drop in radiation readings in her community, Kobayashi said she cannot ask her grandchildren, who are 8 and 2, to come visit her and her husband yet. But she is determined to make an effort for rebuilding. “I don’t know how many more years it will take to bring back the happy sounds of children to our community, but I am determined to do what I can do now,” Kobayashi said. For the first time in five years, a train begins service on the 9.4-kilometer stretch between Odaka and Haranomachi stations in Minami-Soma, Fukushima Prefecture, on East Japan Railway Co.’s Joban Line at 7:33 a.m. on July 12. MINAMI-SOMA, Fukushima Prefecture–In good news for residents, an evacuation order for the southern part of the city here was lifted on July 12 for the first time since the massive earthquake and tsunami crippled the Fukushima No. 1 nuclear power plant five years ago. However, due to lingering fears of radiation contamination, less than 20 percent of the populace are set to return to their homes. The central government allowed residents back into the southern region of the city after midnight on July 11. It marks the sixth time that evacuation orders have been lifted for locales in Fukushima Prefecture, following such municipalities as Naraha and Katsurao. The latest lifting in Minami-Soma affects a total of 10,807 residents in 3,487 households in all parts of the Odaka district and parts of the Haramachi district, making it the largest number of people to be let back into their homes since evacuation zones were established following the 2011 nuclear disaster. Two residents living in a household in an area designated a “difficult-to-return” zone in the southern part of the city are still not allowed back home. However, only about 2,000 residents signed up to stay overnight at their homes in the area ahead of the lifting of the evacuation order. That is likely because many still fear the effects of radiation from the destroyed power plant, which straddles the towns of Futaba and Okuma to the south of Minami-Soma. In addition, five years was more than enough time for residents who evacuated elsewhere to settle down. With at least some of the residents returning home, East Japan Railway Co. resumed service on the 9.4-kilometer stretch between Odaka and Haranomachi stations on the Joban Line for the first time in more than five years on the morning of July 12. The first train of the morning entered Odaka Station carrying 170 or so people on two cars as traditional flags used in the Soma Nomaoi (Soma wild horse chase) festival on the platform greeted passengers. The central government is pushing to lift evacuation orders on all areas of the prefecture excluding difficult-to-return zones by March 2017. FUKUSHIMA, Japan (Kyodo) — The government on Tuesday further scaled down areas in Fukushima Prefecture subject to evacuation orders since the March 2011 nuclear disaster at the Fukushima Daiichi complex, enabling the return of more than 10,000 residents to the city of Minamisoma. Following the move, the city will become mostly habitable except for one area containing one house. But many residents seem uneager to return, having begun new lives elsewhere. The government is in the process of gradually lifting evacuation orders issued to areas within a 20-kilometer radius of the plant of Tokyo Electric Power Company Holdings Inc. and in certain areas beyond the zone amid ongoing radiation cleanup efforts. In Minamisoma, the government lifted evacuation orders for areas except for the difficult-to-return zone. As of July 1, the areas had a registered population of 10,807, or 3,487 households. Radiation cleanup activities have finished in residential areas, but will continue for roads and farmland until next March.